If you live in Pennsylvania, you’re no stranger to the beauty of fall foliage. Surrounded by brightly colored leaves and crisp air, autumn makes for some of the best riding weather. If you're continuing to ride later into the season, we have some tips on how to enhance your motorcycle ride for the change in weather. After the summer riding season, your bike may need a tune-up. Since cold weather causes tire air pressure to drop, your air will have to be increased depending on outside temperatures and the weight of the rider(s) on your bike. Make sure your fluid levels are where they need to be and that all controls are working properly. Check your oil frequently to protect your bike and your safety. Autumn temperatures can fluctuate significantly. It can almost feel like winter in the morning, but still reach the mid-70s or 80s in the afternoon. The best thing you can do to adjust to the changes is to dress in layers. Never wear cotton as a base layer. Rather, wear thermal underwear or something with a synthetic blend as your base layer. On top of the base layer, wear comfortable riding attire. Layers that are easy to put on and remove are especially convenient while riding. For example, don't wear a “hoodie,” but rather a zip-up sweatshirt. It’s important to think about quality over quantity when it comes to your riding attire. Because bikes require your full range of motion, make sure you keep your layers are both functional and effective in protecting you. It may be too hot to wear leather during the summer, but it's perfect for fall. Leather motorcycle jackets or chaps can protect you from the wind and keep you more comfortable while riding. Better yet — they often have removable liners so you can adjust with the temperature. You can wear riding boots with synthetic liners and wool socks. This combination will let your feet breathe in case they get warm. Finally, it's a good idea to wear a pair of synthetic glove liners underneath your leather biker gloves. In case it gets too warm in the afternoon, pack fingerless leather gloves in a storage compartment. As the wind and road debris increase throughout the fall months, facial protection is critical. If you haven’t already, switch to a Department of Transportation-approved helmet. You never know with the weather. In some areas, it can frost as early as October. If fall brings early cold weather, be cautious in shaded, cool, and potentially wet areas. While ice might not make an appearance until later, it’s possible that frost could form overnight and in early hours. Even just rain can take a bad, chilling turn quickly, especially if you're not wearing the best riding attire. Always pack your rain gear, just in case. 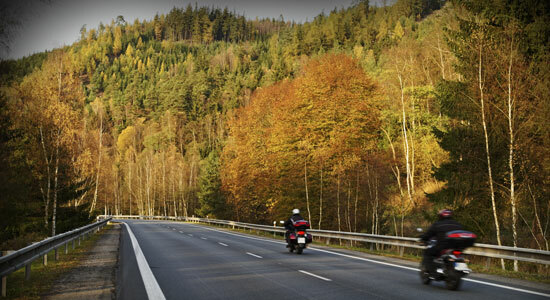 Though a staple of autumn, fallen leaves can make it difficult to operate your motorcycle – especially when you’re braking. When coupled with wet conditions, those fallen leaves can even cause deadly accidents. In fact, your chance of losing traction on wet leaves is said to be higher than on ice. You should also keep alert for any animals on the move. Between fall harvests and hunters, deer will especially be more active. Be particularly observant when traveling roads that are nearby fields and wooded areas. With a break in the heat, fall is also the perfect time to refresh your handling skills. As noted in the Snyder’s Riders “Rider IQ Challenge” in August and September, you’re 148 percent more likely to die or be injured in a crash if you do not have formal motorcycle training (Live Free Ride Alive). If you’re looking for a way to stay connected during the off-season, join Snyder’s Riders, a community of motorcyclists dedicated to staying safe and protecting themselves on the road. For more motorcycle safety information, news, and events, as well as the chance to win prizes, you can join Snyder’s Riders at SnydersRiders.com. Snyder’s Riders has also partnered with Stayin’ Safe Advanced Rider Training to offer members 5 percent off a training program – an extra motivation to get training this fall.